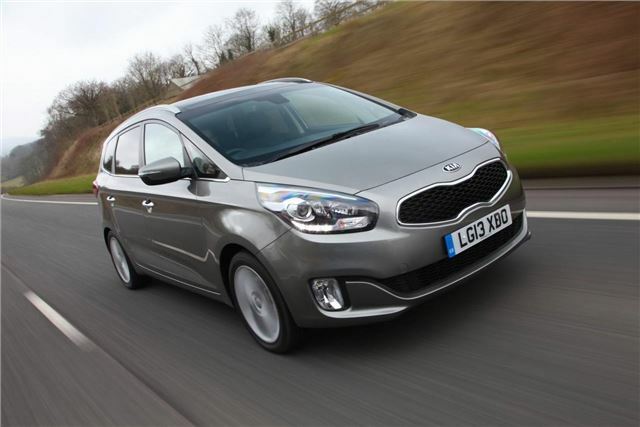 UK prices and specifications for the new Kia Carens have been confirmed from £17,895 on-the-road when it goes on sale on 1 May. The third-generation Carens is now available to order from Kia dealerships. The all-new Carens comes on the back of a record-breaking sales year for Kia - and will boost the company's line-up in the hard-fought mid-sized MPV market, currently dominated in the UK by Ford, Vauxhall and Volkswagen. The seven-seater will be available in the UK with three engines – one petrol and two turbodiesels – two transmissions and three trim and equipment packages. Practicality has been improved over the old model, which is a impressive given that the new Carens is actually smaller than the car it replaces. There are now three individual sliding and reclining centre-row seats in place of a split bench and two separate seats in the rear, all of which fold flat. It also has a roomier boot - longer, wider and taller, and an under-floor compartment. It's better news for passengers, too. A leather-trimmed steering wheel and gear knob with chrome surround are standard across the range. The two upper trim grades add black high-gloss panels with a grille pattern in the dash, upper centre console, doors and steering wheel spokes, and all models have metallic finish door handles and chrome accents within the cabin. The front seat backs also have fold-up tables with cupholders in most versions, and there are cupholders in the second and third rows. The middle-row centre seat folds to create a table. The engine line-up comprises of the 1.6-litre Gamma GDi direct-injection with 135PS and 165Nm; the European-designed 1.7-litre CRDi manual transmission turbodiesel engine, developing either 115PS and 260Nm or 135PS and 330Nm. The standard version delivers maximum torque from 1250-2750rpm and 0-60mph acceleration in 12.6 seconds with a 112mph top speed. The more powerful engine option develops its 330Nm between 2000-2500rpm, which delivers 0-60mph time of 10.0 seconds and a top speed of 119mph. Both 1.7 CRDi power outputs score well on fuel consumption and CO2 emissions: 60.1mpg combined and 124g/km and 56.4mpg and 132g/km respectively, and a diesel particulate filter is fitted as standard. Kia’s Intelligent Stop & Go (ISG) engine stop-start system is standard on all manual-gearbox models. The three trim levels are unimaginatively named ‘1’, ‘2’ and ‘3’. Standard features include seven seats, projection headlights with cornering lamps, LED daytime running lamps, electrically adjustable heated door mirrors, driver’s seat height adjustment and tilt and telescopic steering wheel adjustment, cruise control with a speed limiter, remote central locking, a six-speaker RDS radio/CD player with iPod connectivity, MP3 compatibility and Bluetooth with voice recognition and music streaming. Trim grades ‘1’ and ‘2’ also have a rear conversation mirror, which is replaced by the controls for the panoramic sunroof on trim grade ‘3’. For more details check out the details below.